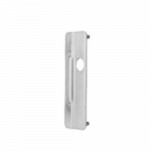 LPG2 Cal-Royal Latch Guard Protector 2 7/8" X 11"
LPG2 Cal-Royal Latch Guard Protector 2 7/8" X 11" Universal Latch Guard for Out-Opening Doors. 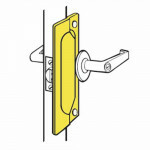 ..
GJLPG2 Cal-Royal Latch Guard Protector 3" X 11"
GJLPG2 Cal-Royal Latch Guard Protector 3" X 11" Quantity discounts available. Similar to Gly.. 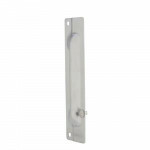 The Ives LG1 Lock Guard w/Security Frame Pin 11-1/2” x 3” for Mortise or Cylindrical is non-handed a..
LG10 Ives Lock Guard - 9-1/2" x 2-1/2"
The Ives LG10 Lock Guard 9-1/2” x 2-1/2” for Mortise or Cylindrical is ideally suited for use with r..
LG11 Ives Lock Guard - 9-1/2" x 3"
The Ives LG11 Lock Guard 9-1/2” x 3” is designed for use on aluminum doors with latch-type locks or ..
LG12 Ives Lock Guard - 9-1/2" x 1-1/2"
The Ives LG12 Lock Guard 9-1/2” x 1-1/2” for Mortise or Cylindrical is a narrow design unit for use ..
LG13 Ives Lock Guard - 7" x 1-1/2"
The Ives LG13 Lock Guard 7” x 1-1/2” is designed for use on all Type 161 Cylindrical Locks (ANSI 156..
Don-Jo ILP-206 Interlock, 6” Latch Guard for inswinging doors. 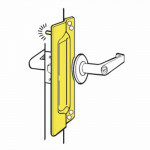 All Backsets, Deadbolts an.. 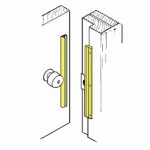 The Don-Jo LP-111 Latch Protector 11” for outswinging doors. All Backsets, Key-In-Lever locks .. 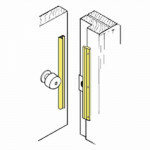 The Don-Jo ILP-212 Interlock, 12” Latch Guard for inswinging doors. All Backsets, Double Locks..
Don-Jo ALP-206 Angle Type Latch Guard 6” for outswinging doors. 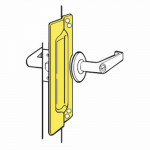 For Mortise and Key-In-Kno..
Don-Jo LP-207 Latch Protector 7” for outswinging doors. 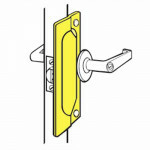 All Backsets, Key-In-Lever Locks and..
Don-Jo PLP-211 Latch Protector w/Pin for outswinging doors. 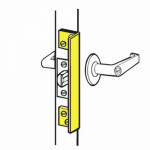 All Backsets, Key-In-Lever locks a..
Don-Jo PMLP-211 Latch Protector w/Pin for outswinging doors. 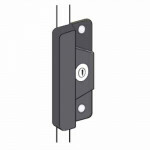 Mortise Locks. Solid steel pin pr.. 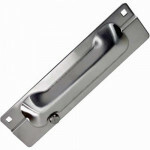 The Don-Jo LP-211 Latch Protector 11” for outswinging doors. 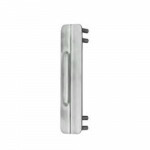 All Backsets, Key-In-Lever locks .. The Don-Jo PLP-111 Latch Protector w/Pin for outswinging doors. 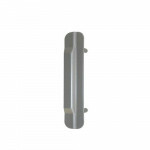 All Backsets, Key-In-Lever l..
Don-Jo LP-107 Latch Protector 7” for outswinging doors. 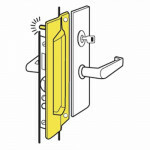 All Backsets, Key-In-Lever Locks and..
Don-Jo ELP-208 is a Latch Guard for Electric Strike for Out-Opening doors. 12GA. 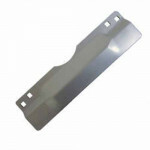 Dimen..
Don-Jo SLP-206 Latch Guard 6” for Out-Opening doors. For Key-In-Knobs Locks. 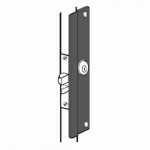 Accepts u..
Don-Jo LP-312 Latch Guard for Out-Opening doors. 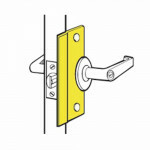 Fits Adams Rite latch lock. Accepts u..